Managing suppliers is a complex process that is often underestimated. 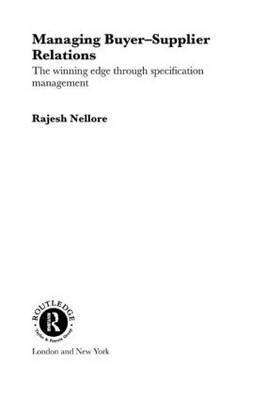 This book presents research carried out by a practising manager in the automotive industry, coupled with over six hundred interviews with representatives from the automotive, aircraft and white goods industries, in order to describe the tools and techniques needed to better manage suppliers. The work offers a specification perspective, and includes analysis of models for outsourcing, visions for suppliers for capacity building, meaning of specification flow and the future of managing suppliers, including systems supply and digital procurement.